Krista is a current resident of Bryant, AR.She has 2 nieces that she loves to spoil and says they are the best in the world! 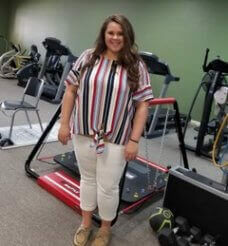 She attended college at UCA for her undergraduate and Harding University for PT school. In her spare time she enjoys relaxing in her hammock and going to the lake. Krista participates in various community service projects throughout her church in Little Rock and surrounding communities. Krista joined our team in May 2018. She loves being able to help people return to their lives. When asked what her favorite part of the job is she says “meeting people from all walks of life and being part of their journey along the way”.